MANAGEMENT OF ANY BUSINESS requires a flow of information to make informed, intelligent decisions affecting the success or failure of its operations. Investors need statements to analyze investment potential. Banks require financial statements to decide whether or not to loan money, and many companies need statements to ascertain the risk involved in doing business with their customers and suppliers. GENERALLY AN ACCOUNTING DEPARTMENT, a bookkeeper or the owner of a business systematically records, sorts and summarizes the thousands of documents (register tapes, invoices and vouchers) representing the transactions of a business. These transactions include: sale of merchandise; payroll distribution; material purchases for inventory - to mention just a few. These facts are then compiled, classified and summarized into financial reports for a business so that a financial statement can then be prepared. FINANCIAL STATEMENTS are customarily prepared on a quarterly, biannual or annual basis. The date of a financial statement is of considerable importance. Most are drawn up on a yearly (fiscal) basis. Statements provided that are outside of the fiscal closing are known as interim statements. LENDERS AND INVESTORS expect to see "pro forma" financial statements included in your business plan. Pro forma statements are hypothetical statements - financial statements as they would appear after a certain set of events occur, e.g., the recognition of sales revenues, recording of accounts receivable, accounts payable, expenses and so forth. When The Business Plan Store writes business plans, we generally prepare pro forma financial statements (income statements, balance sheets and statements of cash flow) by month for the first twelve months of business and by year for the four years thereafter. We will vary that model depending on the needs of our clients. The Business Plan Store includes three parts to the financial statements - the balance sheet, the income (profit and loss) statement, and the statement of cash flows or cash flow statement. A balance sheet is a detailed snapshot of the condition or financial health of a company on a specific date. December 31st is the most popular choice among businesses, however many seasonal businesses issue their statements after their main selling season, because their condition is most favorable at that time. THE BALANCE SHEET shows the dollar amount of assets (what the business owns) and liabilities (what a business owes) in relation to net worth or owner's equity (what the owner, principals or stockholders own). Balance sheets are generally presented with assets on the left side of the page (or top) and liabilities and equity on the right (or bottom). Totals of both left and right (or top and bottom) must be the same since total assets must equal total liabilities plus net worth. THE INCOME OR PROFIT AND LOSS STATEMENT is a detailed computation of the money a business makes or loses over a specific time period. Sales or service income is offset against expenses - operating and productions costs. THE STATEMENT OF CASH FLOWS (or cash flow statement) shows cash receipts minus cash disbursements. It differs from the income statement in that a business can record sales revenue on account (accounts receivable) without receiving cash, and pay dividends or purchase securities or long-term assets - cash disbursements that do not appear on the income statement. 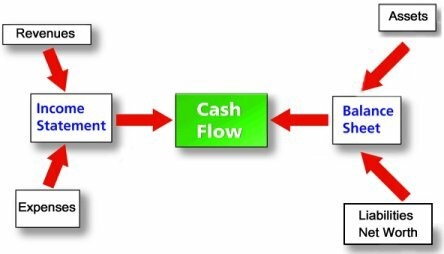 A well-constructed statement of cash flows will begin from the operating profit line on the income statement, identify working capital adjustments (e.g., increases/decreases in accounts receivable, inventory, accounts payable) to arrive at cash flow generated from operations, subtract cash income taxes, interest expense, debt payments, and add/subtract changes in owner's equity to arrive at net cash flow. The proof that financial statements "tie" is that the change in the cash balance on the beginning and ending balance sheets equals the net cash flow for the period. A SHORTCOMING OF REVIEWING FINANCIAL STATEMENTS for a single period is the inability to establish important trends. By comparing two or more successive financial statements of the same concern, a trend becomes apparent. Individual items of the balance sheet and profit and loss statement compared with identical items on previous statements can be significantly revealing in decision making. This observation process is called comparative analysis.